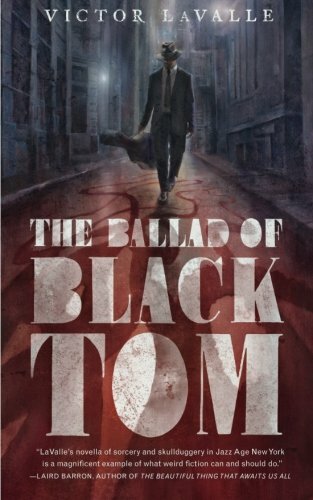 The Ballad of Black Tom (2016) by Victor LaValle is a response to and a retelling of "The Horror at Red Hook" (1927), by H. P. Lovecraft. Lovecraft is generally associated with "cosmic horror": great unfathomable entities beyond human conception from whose perspective we are less than nothing and in whose grand works we are at best collateral damage. They are indifferent and we are not special. Ballad contests the unity of that "we," and questions the sheltered naiveté of fearing mere indifference. Malice is the true order of the universe, Ballad says, hate and malice aforethought all the way down. It was a strange incident to befall so large, robust, normal-featured, and capable-looking a man. "The Horror at Red Hook" begins with this undermining of Malone's normalness and wholesomeness—that is, his whiteness, his able-bodiedness, his masculinity. He freaks out with a "series of terrified, hysterical shrieks," runs away, stumbles, falls. Impotence, incompetence, and emasculation are of course common tools of horror, especially in the Lovecraftian—the implied reader being a white male with a self-image not unlike Malone's, this is meant to create the sense of helplessness, of not-very-subtly coded sexual humiliation, in which this form of horror is rooted. The Ballad of Black Tom begins, by way of counterpoint, with Tommy Tester, a young black man, successfully closing a deal and making money. Tester's a firm believer in Bey's First Law: the best revenge is your paper. His father Otis worked his body to ruin trying to make an honest living with his labour, and for his pains was only ever exploited and cheated out of his earnings. So Tommy Tester has different plans. He can't really play the guitar (unlike Otis—who sings "John the Revelator" to us and to his son when we first meet him) but he can play the part of someone who can, and we see him learning to extend this talent for performance to variously play the musician, the gangster, the hardened purveyor of occult artefacts, all in the service of the hustle—the only role he has trouble playing is that of the subservient black man. Tommy Tester is cocky and confident where Malone is not. Tester's hustle is his weakness, too. Sheer poverty grinds him; when the rich white man Suydam offers him money to play at an event, he can't afford to turn it down no matter how eerie or dangerous it seems, not even when his father warns him against it. He persuades himself into it, swindles himself out of his own well-founded misgivings with promises of a good life separate from the goodness which is already in his life—his friendships, his family, and his community. The streets of Harlem could get pretty crowded with singers and guitar players, men on brass instruments, and every one of them put his little operation to shame. Where Tommy had three songs in his catalog, each of those men had thirty, three hundred . . .
. . . is what Malone sees as mysterious and menacing. Hordes of prowlers reel shouting and singing along the lanes and thoroughfares [. . .] One saw groups of these youths incessantly; sometimes in leering vigils on street corners, sometimes in doorways playing eerily on cheap instruments of music . . .
Narratives that "The Horror at Red Hook" sees from the outside, faceless immigrants and dark-skinned masses, Ballad shows us from the inside. This is not a demystification, however; rather, it was "The Horror at Red Hook" that mystified the ordinary lives of poor, disenfranchised communities in the first place, and in doing so moved the weight of that poverty, that disenfranchisement, outside of the knowable. I find that a lot of the responses to Ballad boil this all down to simply saying that Lovecraft was racist and that "The Horror at Red Hook" is one of the most racist stories in his body of work—which is true, of course. But the point here is not that we must dismiss or abjure "The Horror at Red Hook," and this is why it bothers me when many critical or readerly responses to Ballad note that they've never actually read "The Horror at Red Hook," or don't think it necessary to read it in order to read Ballad, or consider it forgettable trash on the grounds that it is racist. It is inarguably racist; it is arguably trash; but it has an ugly, squamous, and slithering power to it. If Ballad can give it the courtesy of a close reading and a response, so can we. Aside from its social and political commentary though, The Ballad of Black Tom should be applauded for making of "The Horror at Red Hook" an actual story. It is a gripping yarn, featuring real characters with real motivations—a claim that can not safely be made for the original tale. Here long ago a brighter picture dwelt, with clear-eyed mariners on the lower streets and homes of taste and substance where the larger houses line the hill. One can trace the relics of this former happiness in the trim shapes of the buildings, the occasional graceful churches, and the evidences of original art and background in bits of detail here and there—a worn flight of steps, a battered doorway, a wormy pair of decorative columns or pilasters, or a fragment of once green space with bent and rusted iron railing. The houses are generally in solid blocks, and now and then a many-windowed cupola arises to tell of days when the households of captains and ship-owners watched the sea. That is, the households of slave traders—as "The Horror at Red Hook" does not say. Like the running thread with music, one of the new subplots that Ballad introduces is the magic of esoteric languages and the power of secret words. "That’s a fine git-fiddle," the man finally said. And it was the term—git-fiddle—that assured Tommy his hustle had worked. As simple as that. The old man wanted Tommy to know he could speak the language. Long before his transformation into Black Tom, when we meet him for the very first time, the deal that Tommy Tester's closing is that he's selling a book of the Supreme Alphabet to a mysterious woman called Ma Att, herself a greater-than-human figure who perhaps represents a personification of the Thelemic Aeon of Ma'at attempting to actualize itself. Later, Black Tom himself banishes her again, taking the book back. He has his own designs on the future aeon. But it's interesting that Black Tom's magic always remains rooted in Tommy Tester's life and knowledge: the music and the Supreme Alphabet. This Supreme Alphabet can't be quite the same as ours, the one of Clarence 13X and the Five Percenters, since Ballad is set a few years before Clarence was born. But perhaps in this world he is not so much the author of the Alphabet as its chronicler; the Alphabet is powerful esoteric knowledge that Tommy Tester knows, and that even Malone knows of through his studies, but that Ma Att does not know, and that Otis is protected from through his illiteracy. Black Tom puts the Supreme Alphabet to grisly use at the end, using it as a chisel to crack open the world. The last glyph he draws in blood is Zig-Zag-Zig, which represents the journey from knowledge to wisdom, and from wisdom to understanding. Or, as a different tradition might put it, first the mountain and the river are the mountain and the river, then they are not, and then they are again. Wisdom is alienation, but understanding is harmony. To Black Tom in his grief, that harmony lies in the silence at the far end of the anthropocene, when the Sleeping King finally takes possession of the burning air and the poisoned sea that was prepared for him. This is the choice that he makes. In "The Horror at Red Hook," Malone becomes involved with the neighbourhood of Red Hook as a participant in and enthusiast of police brutality against a community of Kurdish immigrants, later revealed to be Yazidi. Eventually, the police assault on Red Hook reaches a crescendo and the targeted buildings are brought down—a scene of tremendous violence also, and more viscerally, depicted in Ballad. The Ballad of Black Tom is divided into halves and the first half belongs to Tommy Tester. Near its end there's a moment where, lost in grief after Otis is murdered, Tommy Tester sings that conjure music he learned from his parents. This, rather than the later crossing of dimensional thresholds, marks for me the moment he becomes—wilfully, understanding the consequences—Black Tom. As all its acolytes know, the only true stage of grief is rage. There is a hollow place of bereavement when any of us would open the door to the Sleeping King. "I felt in danger for my life," Mr. Howard said. "I emptied my revolver. Then I reloaded and did it again." Howard lies with a smirk and a sneer and a straight face, lies about mistaking a guitar for a gun, and Malone, the sensitive white poet/cop, disapproves but looks away. Howard is guilty, but Malone is guilty, but the world is guilty, and we come to the crux of the argument that Ballad makes. His night with Robert Suydam returned to him, all of it, all at once. The breathless terror with which the old man spoke of the Sleeping King. A fear of cosmic indifference suddenly seemed comical, or downright naive. Tester looked back to Malone and Mr. Howard. Beyond them he saw the police forces at the barricades as they muscled the crowd of Negroes back; he saw the decaying facade of his tenement with new eyes; he saw the patrol cars parked in the middle of the road like three great black hounds waiting to pounce on all these gathered sheep. What was indifference compared to malice? When Malone asks Black Tom—Tom in his incandescent, barely contained rage, Tom with his father's bloodstained guitar, Tom with his father's straight razor—what he wants if not power, Tom quotes Frankenstein, the moment that the monster declares war against humanity. And we cannot fault him in this. When Tom makes the choice to awaken the Sleeping King—to choose human extinction over white supremacy—it is the only legitimate choice left to make. The world does not deserve better.